Stocks Are Up 5% in 5 Days: Bolt or Buy? When it comes to valuing the stock market, the price-to-earnings ratio (PE) is often cited. Calculating the PE ratio for any security is straight-forward, divide the price of the stock or index by its 12-month earnings. As an example, the S&P 500 closed friday at 2760.17, and the index earned $150.53 in operating profits over the past 12 months ending September 30, 2018; therefore, the PE ratio is 18.33. Professional money managers, hedge fund owners, private equity investors, venture capitalists, and real estate moguls keep a close eye on asset valuations, vis-à-vis price-to-earnings ratios. Since 1988, the S&P 500 traded at an average PE multiple of 17.95, priced on earnings from continuing operations. On September 20th, the S&P 500 closed at 2,930.75, its 19th record of the year! The celebration was short-lived; over the next 64 days, stocks did an about-face and turned sharply downward. Over the next two months, the index posted losses 30 out of 45 trading sessions falling to 2,632.56, minus 10.17%, correction territory. Perma-bulls argue the economy is strong and corporate profits have yet to garner the full benefit of the 2018 Tax Cuts & Jobs Act. Furthermore, they contend once the tariff tangles with China abate and the Fed loosens the reins upon monetary policy stocks will continue their ascent. Markets are known as leading indicators in that they forecast what’s to come, both optimistically and pessimistically. So, what’s the market trying to tell us and, is the market always right? Since 1950, the United States economy has experienced ten recessions. Recessions are defined by the Nation Bureau of Economic research, as two consecutive quarters of GDP contraction. During this timeframe, the S&P 500 witnessed 33 market downturns exceeding ten percent. Hence, I update the old joke, “The stock market has predicted 33 out of the past ten recessions.” In other words, the market is not always correct about the future and at times gets behind, or ahead, of itself. Notice the PE ratios after the fact, in September 2000, and June 2008. The ’00 period was sparked by euphoria stemming from the dawning of the internet era. The ’08 excitement was ignited by profligate credit access and housing mania. During both of these episodes, forecasted earnings for the subsequent year after analyst revised estimates lower, showed markets 83% overvalued compared to their long-term average. Operating earnings for the S&P 500 are predicted to reach $174 at year-end 2019, with the index at 2,760 equating to a 15.86 PE ratio, 11.6% below its 30-year average. 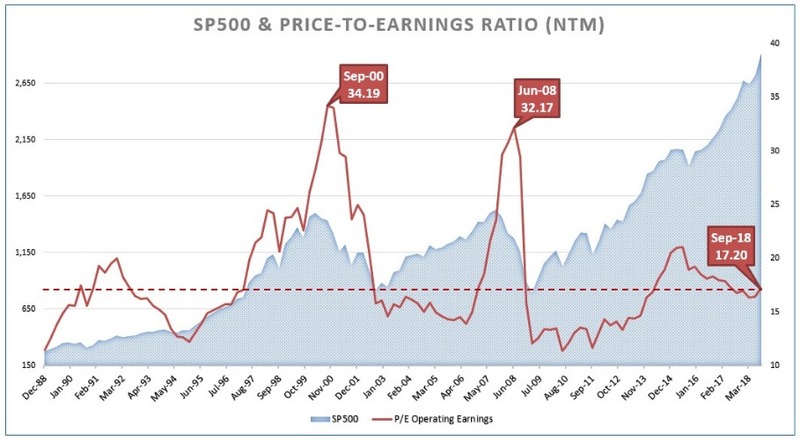 For today’s S&P 500 valuation to follow suit with the ’00 and ’08 debacles, forward earnings would have to be cut by over half to $83.65 per share, levels last seen in Q4-2010. Sellers contend that 2019 will be the top in this earnings cycle. Buyers disagree and see this bull market continuing to higher levels. Who will be right or wrong six months from now? Warren Buffett says, “Stocks are voting machines short-term, and weighing machines long-term.” By that, Mr. Buffett informs investors that asset prices ultimately follow their fundamentals, i.e., sales and earnings. DISCLOSURE: DISCLOSURE: The opinions made herein are for informational purposes and are not recommendations to any person to buy or sell any securities. The information is deemed to be reliable, but its accuracy and completeness are not guaranteed. 1st Discount Brokerage does not accept any liability for the use of this column. Readers of this column who buy or sell securities based on the information in this column are solely responsible for their actions. Investors/traders are advised to satisfy themselves before making any investment. Nothing published on this site/ article should be considered as investment advice. It's not an offer to buy or sell any security. Readers are solely responsible for their profits or losses.